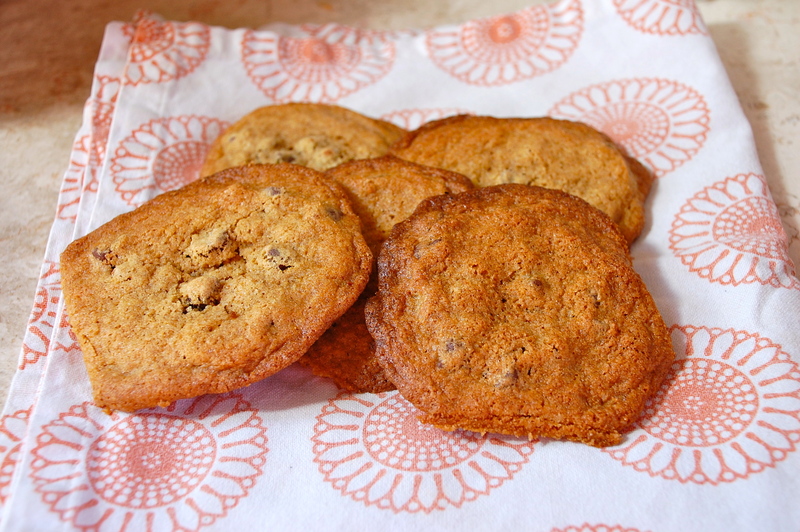 I fell in love with this chocolate chip cookies recipe from the Orangette blog the first time I made it and the second time, I’m fairly sure a lifelong commitment has been made. The whole wheat flour part totally compelled me. We’ve been adding more and more whole wheat flour to our baking repertoire, but I’ve never tried it to make cookies without at least some all-purpose flour mixed in. A friend asked this morning when I offered up the goodies, “Is there lots of butter in them?” and the answer is a resounding YES. LOTS of butter – which results in soft, chewy chocolaty melt-in-your-mouth cookies that I’ve never managed to create at home before. Baking these with Talia made for a fun afternoon on a stay-at-home-sick day. Preheat oven to 350°. Line two baking sheets with parchment paper or Silpat mats, or butter if no lining is available. Combine the flour, baking soda, baking powder and salt and mix together. Cream butter and sugars in a mixer until well combined – about 2 minutes. Add egg, beating well on low-medium speed. Beat in vanilla. Add flour mixture, 1/3 at a time, until just incorporated – be sure not to overmix. Add in chocolate and nuts and briefly mix on low speed. Scrape down the sides of the bowl with a spatula and give the batter a final hand-mixing to make sure the add-ins are well distributed. Scoop 1 tbsp. sized mounds onto two cookie sheets. Refrigerating or freezing part of the dough is also a good option – I’m curious to see how they’ll taste after the dough matures for a day or two. Be sure to give the dough scoops a lot of space – they spread quite a bit as they melt. Bake for 15-17 minutes, rotating the sheets halfway through to ensure even baking. Cool for 1-2 minutes, then transfer to cooling rack. Be sure to try one warm! And by the way, the raw dough is darn good too. 3. Bring your butter to room temp — I forgot this rule for cookies (and instead adhered to the cold butter for good pastry dough rule) and also didn’t read very closely, apparently, because otherwise your cookies will be crispy and pocked (like a good pastry dough…). OK, time to get the next batch out of the oven! Just made these. So delicious! Delish! And a fun “too hot to play outside” activity with my little one. Thanks! I made them the other night and added dried cherries. I used graham flour and they came out great! Our freezer is stocked with cookie pucks from the large amount of dough :)Thanks for the recipe! Excellent add-ins and I’m glad you mentioned freezing the dough. I’m always tempted but end up baking all of them. I was just admiring the Kim Boyce book in the store the other day. Would love to hear more about what you make from it.